The above three sites are covered by Tracy Gallagher, and Alicia Noonan (Poughkeepsie) . As partners we work together to provide the most comprehensive local coverage of family events in our areas. Click on the above icons to see the individual newsletters and websites. 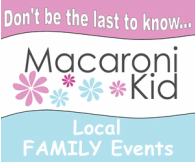 If you are located outside our areas or know of someone who is, you can find more local editions through the national website www.macaronikid.com.